The French sailor’s shirt has been a staple on beaches from France to well, France. And sometimes you see them in ads (Jean-Paul Gaultier is a fan), or on famous artist’s backs (M. Picasso’s, most famously and perhaps alone.) Gerald Murphy outfitted himself and the crew of The Weatherbird in them. Weirdly enough, my shirts are by an English-sounding company: St. James and were purchased in Nice, close to the port, across the street from that English-language bookstore which yielded a roughed-up paperback copy of “Casino Royale” and a Penguin edition of “My Man Jeeves.” A banner shopping day. The shirts are French, though, originally the wool was produced in Normandy, not far from Mont Saint-Michel, in the fortified city of Saint James. Yes fortified, it’s that old. Having been founded by William the Conquerer, Saint James was also one of the stops on the traditional Christian pilgrims’ route to Santiago de Campostela. The company that produced and sold the wool went public in 1929 and by 1950, it was outfitting lifeguards in France. Today, there are a number of designs, colours and even articles of clothing produced by Saint James, but it’s still the striped fisherman’s shirts and button-shoulder pull-overs to which I gravitate. I’m not sure that this is a look that everyone can pull off. You will be noticed — boat necked, long sleeved, striped, heavyweight cotton shirts tend to get noticed, especially in a sea of Tommy Bahama t’s and the odd Aloha shirt. To say nothing of the sweaters that button at the left shoulder. They also look phenomenal on women, where the boxy cut accentuates without clinging. The cut is boxy, at best, and the shirts are much better with some age on them. But with a good tan, a pair of blue linen drawstring pants, white shorts, or jeans they are hard to beat and will never go truly out of style. And don’t forget your espadrilles. They’re already staring anyway. This entry was posted in Elegantology and tagged casual clothing, Elegantology, traveling. Bookmark the permalink. Somewhere exists a photo of me, sailing on one of the traditional Chesapeake Bay Skipjacks, in cream linen slacks, a red/cream sailor’s shirt and blue espadrilles. When I first moved to Wales, I worked for a friend’s vintage store, A Twist in the Tail, which had men’s vintage clothing. As I didn’t have a bank account in the UK at that point, my payment was some gold cufflinks and another Breton shirt, this time in blue & white, with the buttons on the shoulder. Elegant, I adore that photo! And after checking out the Saint James website, I see why you’re loyal to the brand–it’s a great range, and I’ve always loved the loungy, laid-back look of all things nautical. one year, we sported st.james for a “nautical” holiday card. we still love them. nautical is always in style. Ah, how I’ve missed you. I owned two in college, one red, one navy. I’m buying a new one today – my heart jumps every time I see one. Hello all! Somehow I knew my loyal readers would be well-kitted out with a sailor shirt or two. What is it that Arlo Guthrie sang? “And if four people do it, in harmony… well friends, then it’s a movement.” Nothing says fair weather to me like a nautical stripe! Working diligently to get back to reading you all as I miss my daily doses of beauty, charm and wit. Today’s post explains more. TIG, thanks, it brings back fond memories. 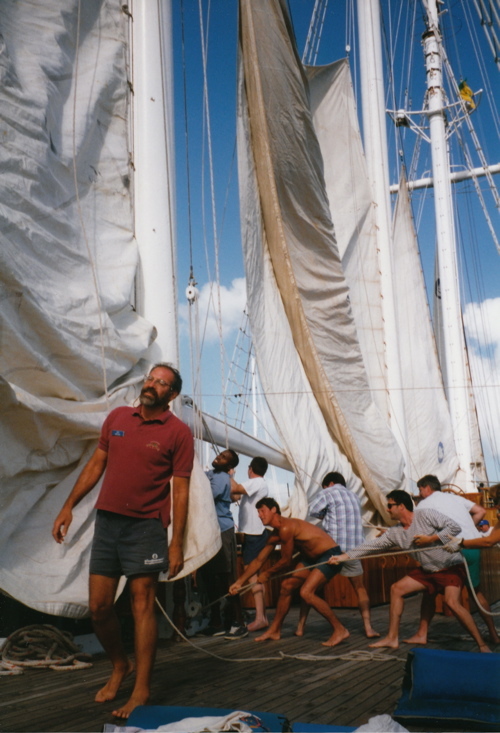 Unfortunately, it is also a momento mori as the Fantome (of the Barefoot Cruises fleet) went down during a hurricane with all hands about a year after this photo was taken. Passengers were set ashore, but the ship was ordered out of safe harbour by management. Reports said that it was as if the storm stalked them, turning whenever they tacked. Captain Guyan was the youngest Cap’t in the fleet. That’s the First Officer there in the red shirt. Shades of The Medusa. Fairfax, I used to reinvest in my store with every paycheck when I sold suits, I can relate. Mrs. PVE, what a concept! I bet it was the best received card of the season. Mrs. Blandings, and I you. Red or navy this time around? I also have a black stripe on a beige ground. It doesn’t see as much service. Aesthete, unfortunately not– they’re tough to find! Mine are striped, though.